Universal has announced it is bringing 'Coraline' to Blu-ray in late-July as a two-disc special edition with 2-D and 3-D versions. The sleeper animated fantasy, which grossed over $60 million during its domestic theatrical run, will arrive on Blu-ray July 21 (day-and-date with the standard DVD). Both 2-D and 3-D versions will be presented on a BD-50 dual-layer disc via seamless branching, with 1080p video (1.85:1) and English DTS-HD Lossless Master Audio 5.1 Surround. Extras include audio commentary with director Henry Selick and composer Bruno Coulais, three featurettes ("Making of Coraline," "Voicing the Characters," "Creepy Coraline") and deleted scenes. Exclusive to the Blu-ray (on the 2-D version only) are two U-Control picture-in-picture tracks, and "Tours and Voice Sessions" featurette, as well as My Scenes Sharing and "The World According to Henry" BD-Live functions. A second standard DVD disc will include a Digital Copy of the film compatible with PCs and iTunes (expires July 31, 2010). Suggested retail price for the Blu-ray has been set at $39.99. 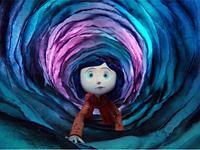 You'll find the latest specs for 'Coraline' linked from our Blu-ray Release Schedule, where it's indexed under July 21.